James Ewell Brown was born on February 6 1833, to Laura and Archibald Stuart at Laurel Hill Farm the family plantation. James was the fifth of eleven children he was the youngest son and the oldest son to survive childhood. James received an appointment to West Point in 1850. He was a very popular student at the United States Military Academy at West point. He was nicknamed “beauty” by his classmates who sarcastically called him this because he was very homely looking during his time at West Point. After graduation he grew a beard and it was said about him that was “The only man made better by a beard.” In 1852 Robert E Lee became the superintendent of West Point, he soon became close friends of the Lee family. Stuart graduated 13th in his class. After graduation he was given the rank of Brevet Second Lieutenant in the US Cavalry where he served during the Indian Wars and during the bleeding Kansas debacle. Stuart was the man assigned to carry the orders to Colonel Lee telling him that he was to capture John Brown. JEB Stuart as he had come to be known by his friends volunteered to be an aid-de- camp and distinguished himself by offering Brown his ultimatum. After his home state of Virginia seceded JEB resigned his commision in the US Army to serve his new country the Confederacy in the Cavalry. He served in the cavalry as a Lieutenent Colonel. He was promoted to Brigadier General on September 24 1861. JEB was in almost all the major campaigns and battles that the Army of Northern Virginia was in from the Peninsula to the Wilderness. 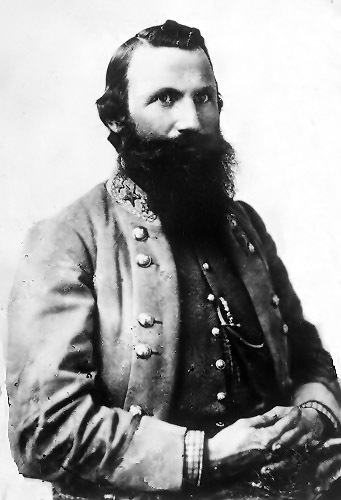 The 31 year old General JEB Stuart was buried in Hollywood Cemetary in Richmond Virginia. He left a great legacy he has two high schools named after him and a statue built for him in Richmond along with the other statues other famous Confederate Generals. There is also a tank named after him the M3 Stuart tank. He also has a memorial placed over the graves of himself and his wife Flora. JEB Stuart was one of the most famous Cavalrymen in the Civil War and one of the most beloved Confederate Generals. Joshua Lawrence Chamberlin known as the “Hero of Gettysburg” was born in Brewer Maine on September 8, 1828 to Joshua and Sarah Dupee Chamberlin. Joshua was the oldest of 5 children. Joshua entered Bowdoin College in 1848. He taught himself to read Greek in order to pass the entrance exam. While a student at Bowdoin he met people who would influence him greatly such as the wife of a professor Harriet Beecher Stowe. Joshua married Fanny Adams the daughter ( adopted) of a local Clergymen in1855 . His new father-in-law along with his mother urged Joshua to enter the into training to become a pastor. Which he did in 1855 and 3 years following. Joshua was not suited to be a man of the cloth. He didn’t enjoy it so he left Bangor Theological Seminary were he was attending. When the Civil War began he felt that he ought to fight but the administration at Bowdoin College were he was a professor of Rhetoric thought otherwise. They offered him a sabbatical to study languages in Europe but Joshua turned them down and offered his services to the Governor of Maine who then offered him the colonelcy of the 20th Maine but he turned it down to “start a little lower and learn the business first.” So he took the rank of Lieutenant Colonel under Adelbert Ames in the 20th Maine. The Joahu and the 20th Maine were at many important battles such as Antietam. Chamberlin’s regiment did not enter into the battle of Antietam though they were placed in reserve. They were also in the Battle of Fredricksburg in which they took part in the famed attack on the wall at Marye’s Heights. The 20th Maine was forced to spend two nights on the battlefield after the battle. On the first night while they were burying their dead a very rare thing occurred, the Aurora Borealis happened. One of the most famous battles in which Colonel Chamberlin was in is Gettysburg. This is the battle in which Chamberlin and the 20th Maine made a name for themselves on a little known hill in a previously little known town of Gettysburg. Chamberlin and his men were positioned on the very end of the Union line they were the extreme end on Little Round Top in Gettysburg. If they had retreated then the whole Union line would have been swept by the Confederates. He stayed and made a very unlikely maneuver when he ordered his men to charge down the hill because they were running low on ammunition. This move saved the Union Army because the Confederate troops who were charging and had been charging almost broke through the line. Chamberlin was also in many other battles including Petersburg where Chamberlin was wounded he was shot through the pelvis. Chamberlin also was at Appomatox when General Robert E. Lee surrendered. Joshua received the swords of the Confederate officers and he received the guns of the Confederate soldiers (not all at one time of course). After the war Chamberlin became the Governor of Maine from 1866 until 1869 after his time as Governor he became a professor again at Bowdoin College were he taught until 1883. In 1893 30 years after the battle of Little Round Top Joshua was awarded the Medal of Honor for his actions at that battle. At the age of 70 in 1889 he volunteered to be an officer in the army during the Spanish-American war but was turned down this was one of the worst disappointments of his life. Joshua Lawrence Chamberlin died in 1914 due to the wounds he received at the Battle of Petersburg. Thus ends the life of the hero of Gettysburg. Who really established America? Who gave us the freedom that we treasure today? Who is the one really in charge of our nation’s history,present, and future? God did all of these things and is in charge of all of these things. God has made his presence known throughout history in many different and miraculous ways including in the Civil War. Did you know that your freedom and mine both came from the God who divinely established America way back when the Pilgrims landed at Plymoth Rock in the 1600’s. It is the same God that General George Washington prayed to at Valley Forge in that ever famous Painting of Washington on his knees in the snow. God made his presence known widely throughout the Civil War. He did this at Fredricksburg through the Northern lights. The Northern lights almost never happen in that part of Virginia because it is to far North. After the battle the Aurora Borealis showed up and the wounded on the field and those trapped on the field were treated to a magnificent show. Also those in the town recieved a good show. The men who saw it knew that it was God trying to tell them something. God was trying to tell them that no matter what happened God would choose who the victor of the war would ultimately be. God used the Aurora Borealis to show that he was and is the God of battles and wars. During the Civil War God used another thing called an accoustic shadow to show his greatness. An Accoustic shadow is created when there is a very loud noise such a cannon firing, and when it fires and someone is only a mile froom it they won’t be able to hear a thing but a spectator 5 miles away will hear the boom like he was very close that is an accoustic shadow. I think God used that to show his power and presence during the Civil War. To those of you who don’t belive God had any part or place in our history as Americans just go back and read some of the accounts of what happend and you will see God in our History.